"What's more trees STORE ?" "more trees" is a foresty conservation organization founded by renown musician Ryuichi Sakamoto with over 100 supporters from various industries. We thin forests in Japan and plant trees abroad. 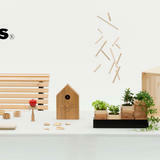 "Wonder Forest" Under the theme of “Connect our urban lives with local forests”, more trees design, Inc. make wooden products with product designers and local craftsmen, produce spaces and organize events to utilize the wood from local forests of Japan. Around 70% of Japanese land is covered with forests, of which about 40% is artificial forests mainly consisting of cedar and cypress. We need to care them appropriately with thinning trees and utilize those thinned woods as well. Without the healthy cycle of cares, the forests will be degraded that would result in weakening local regions and communities. By introducing and providing the warmth and gentle touches of Japanese wood, we promote the use of local woods and invigorate the domestic wood market. This is how we contribute to the local regions to develop, support their forestry and preserve beautiful forests.